Home | Vitamins | Letter Vitamins | Vitamin C | Vitamin C Gummies 250 mg.
Vitamin C promotes immune system function. ** As a water-soluble nutrient, Vitamin C helps fight the cell damaging free radicals that can lead to oxidative stress and the premature aging of cells. 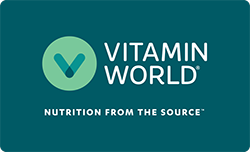 ** Vitamin World's Vitamin C Gummies deliver 250 mg Vitamin C per serving. Other Ingredients: Sugar, Glucose Syrup, Pectin, Citric Acid, Sodium Citrate, Natural Flavor, Color Added (Annatto). Warning: If you are pregnant, nursing, taking any medications or have any medical condition, consult your doctor before use. Discontinue use and consult your doctor if any adverse reactions occur. Keep out of reach of children. Store between 45 - 75 F. Do not use if seal under cap is broken or missing. Vitamin C Gummies 250 mg. is rated 4.5 out of 5 by 10. Rated 5 out of 5 by Anonymous from Good product. Fresh, not tough gummy, no excess sugar on outside, good flavor, don't stick together. Rated 5 out of 5 by baybug from I did not examine other reviews I'm 82+ years young and I treat myself to these Gummies. They're the best I've ever tasted.. Rated 3 out of 5 by Grmi14 from Not amazed I am not amazed with the product, I like that it isn't as sour as other ones I have tried . The gummies are all stuck together besides that fact it is very sticky and sticks to your teeth when chewing . I would not purchase this exact same product again. Vitamin C is a product to always have in handy . Rated 5 out of 5 by REGOLITH671 from Great Vitamin C Gummy These gummies are a great way to get your daily dose of Vitamin C. I enjoy them over the traditional tablet. The only thing I don't like is when they get stuck together. Usually the case upon purchase. This could be a shipping issue on temperature. Overall great buy! Rated 4 out of 5 by Ramena from Great but gets stuck in my teeth when chewed Great, but gets stuck in my teeth when chewed. Rated 3 out of 5 by Kathy from Good product These are the only C Vitamins my 5 year old granddaughter will take. The only disappointing aspect of these vitamins is the fact that they stick together in the bottle. I have a hard time separating them, and they are hard to reach once I get closer to the bottom of the jar.